America's NEW Old-Time Radio Variety Show! "The Next Prairie Home Companion"
​Educational and Entertaining for the Entire Family! 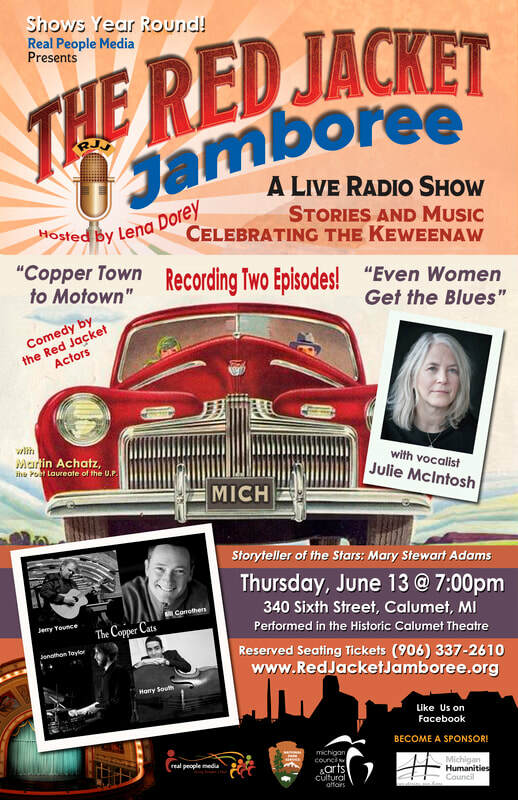 ​The Red Jacket Jamboree is America's NEW old-time radio variety show sharing stories, songs and history from Michigan's Keweenaw Peninsula (Copper Country) Hosted by Lena Dorey, the show is performed/recorded in front of a live audience at the historic Calumet Theatre in downtown Calumet, Michigan. Two hourlong episodes are recorded per performance for later radio broadcast. Find out how to listen! ​The Red Jacket Jamboree is a production of Real People Media, a 501(c)3 nonprofit organization helping people share their stories through literary, visual, performing and media arts. The show is written and directed by Rebecca Glotfelty. Every show features music by our stage band, the Copper Cats, under the direction of Jerry Younce on guitar, Bill Carrothers on piano, Harold South on bass and percussionists. In addition, every show features a guest vocalist/singer-songwriter/band. Follow the adventures of McLain and Molly in "Some place on Fifth." Molly and McLain have recently moved to Calumet to pursue their dream of owning a business in the historic district. If only they could figure out what that business should be! ​Including commercials from The Upper Peninsula Pasty Association, The U.P. Sauna Association and more!